I love your front door. 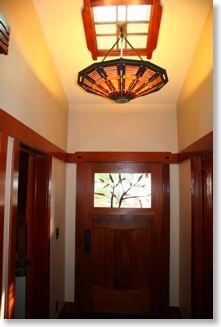 Would you mind telling me the manufacturer of the front door and where I can purchase it? 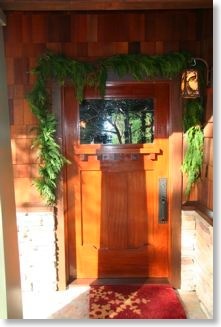 This is actually a custom door of my own general design with final design by the woodworker, Joe Madden. It is solid mahogany, 2.25" thick, 42" wide, and weighs 150 lbs. 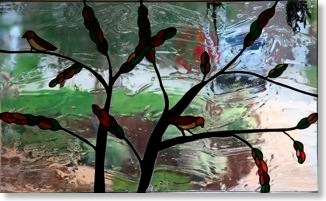 As you can see on the web site, I made the stained glass about a year after the door was in. I had the door made with a removable frame that slides into place and is held in by 3 screws at the bottom. This way I can swap out the glass at any time. The manufacturer was Joe Madden of Madden Millworks in San Pedro, CA.